Last year, my dad and I went to see Apollo astronaut Ken Mattingly give a lecture in Pontefract, organised by Space Lectures. This year, the same organisation persuaded an even more famous astronaut to come over to the UK: none other than Captain James Lovell Jr! Jim Lovell was originally a Navy test pilot before joining NASA in their second group of astronauts in 1962. He flew in space four times in all; he is one of only three astronauts to go to the Moon twice; and following his second spaceflight, he held the record for spending more time in space than any other astronaut until the Skylab missions. Most famously, he was the commander of the ill-fated Apollo 13 mission in 1970, and was portrayed by Tom Hanks in the 1995 film about the flight. Undoubtedly, the 87-year-old Captain Lovell would have a lot to talk about with an interested audience – and he did. I was pleased that Lovell wasn’t just going to talk about Apollo 13: he began by describing his three other missions. First there was Gemini 7, a two-week endurance flight involving all sorts of medical experiments; then Gemini 12, and the EVA work conducted by his co-pilot Buzz Aldrin; then Apollo 8, the first manned mission to travel to the Moon. Lovell’s enthusiasm really came through here as he described the crew’s excitement to see the Moon close-up, and how he himself felt observing the Earth from so far away – so far that he could hide everything he knew behind his thumb. 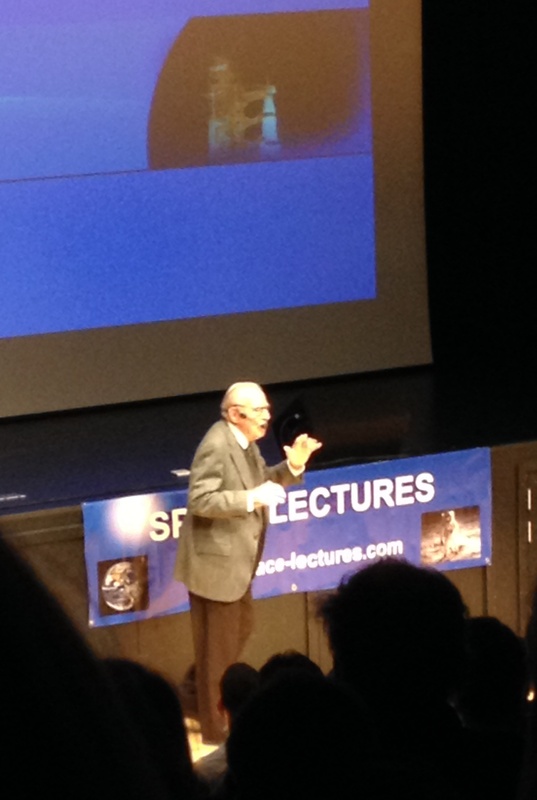 The lion’s share of the lecture was reserved for Apollo 13. Lovell went into a lot of detail about the series of errors that ultimately led to a faulty oxygen tank exploding, and the challenges that followed: transferring guidance data to the lunar module computer, flying the lunar module with the weight of the dead command-service module still attached, and performing an engine burn manually with the lunar module’s computer turned off to save power. He concluded the lecture by narrating a video of Apollo 13 highlights, originally made for the investigation into the accident. Lovell made us laugh plenty of times, such as when he described telling off his rookie crewmates for being more interested in looking at the Moon than copying down essential instructions. (“If we don’t get this right, you won’t get those photos developed!”) Not getting to land on the Moon was obviously a major disappointment for Lovell at the time, but he ultimately felt that a lot of good came out of Apollo 13, most notably how well NASA demonstrated their ability to improvise and manage such a crisis, bringing the crew home against all odds. One of the best things Lovell said during the lecture was about looking at the Earth on Apollo 8. He suggested that, rather than going to Heaven when we die, we actually go to Heaven when we are born – that is when we become able to experience all the wonderful experiences that our small, fragile, beautiful planet has to offer. It was very uplifting, and a good thing to be reminded of. 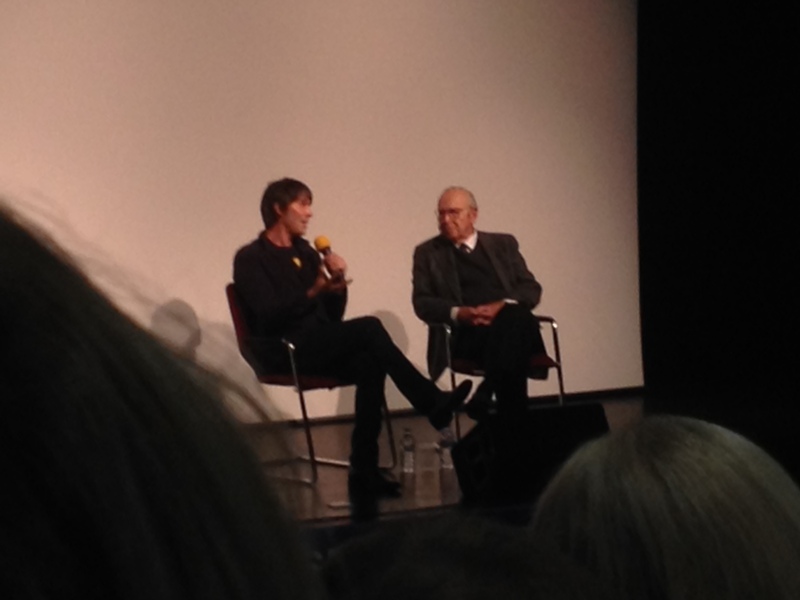 Thank you to Jim Lovell, Professor Brian Cox and Space Lectures for a very special day! This entry was posted in Out and About and tagged Apollo 13, Apollo 8, Brian Cox, Jim Lovell, Space Lectures. Bookmark the permalink.